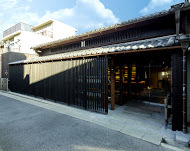 Nakagawa Masashichi Shoten was established in 1716 in Nara Prefecture. Since then, it has continued to deal in handspun and handwoven ramie fabric, and commemorates the 300th anniversary of its establishment in 2016. The products sold by Nakagawa Masashichi Shoten are primarily household goods that were conceived by applying Japanese craftsmanship and design. We are discerning new sense and wisdom from time-honored Japanese culture and traditions, to produce numerous high quality products designed to fit naturally into a modern lifestyle. An example is our company’s mainstay product, “Hana Fukin,” a dish cloth conceived by recognizing the water-absorbing and quick-drying functionality of mosquito net material, a specialty product of Nara. Apart from our household goods brand “Nakagawa Masashichi Shoten,” we have several house brands such as “Nipponichi” which deals in souvenirs that apply local craftsmanship and local motifs, and “Yu Nakagawa” that proposes textiles combining traditional Japanese materials, technology, and design with modern sensibilities. We directly manage 45 stores throughout Japan (as of January 2016). industry in Japan. In 2007, we established our corporate vision to “invigorate Japan’s craftsmanship industry” by supporting the rehabilitation of local small and medium-sized companies and fostering vibrant businesses in production areas around the country (local “star” businesses). With a focus on makers to whom we have provided our expertise, we aspire to build a mechanism for preserving Japanese craftsmanship for posterity by bringing about a chain reaction in the revitalization of surrounding communities and the endurance of entire production areas. From the perspective of “tourism,” we have been supporting craftsmen through our retail know-how in the transportation infrastructure, such as sales on board bullet trains and airports and by producing local souvenir shops. We have been broadening the range of our activities such as by starting an initiative to restore a local Nara craft called Nara Sarashi (Nara Bleached Fabric), putting a spotlight on the crafts of various regions, and beginning the “Nipponichi Project” which aspires to the local production for local consumption of crafts. Nara Sarashi originated in the Kamakura Period (1185–1333), and there are records indicating that this method was used to bleach the stoles of Buddhist priests of the Nanto temples. The name “Nara Sarashi” first began to be registered in documents from the latter 16th century when Genjiro Kiyosumi succeeded in improving the bleaching technique. It was mainly used for the kamishimo (ceremonial dress worn by the samurai) and the robes of Buddhist priests. From the first half of the 17th century, it flourished as an industry after being authorized with the Tokugawa government’s Nanto-kai (Improved Nanto) red seal and designated as goyo-hin (supplies delivered to the government). 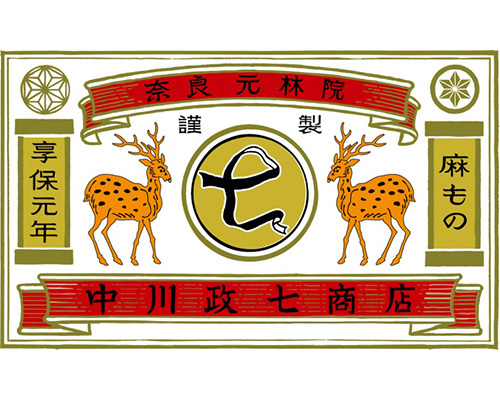 The history of Nakagawa Masashichi Shoten began during this golden age when our first-generation founder Kibei Nakaya began trading in Nara Sarashi. From the latter part of the Edo Period, trade from other production areas such as Echigo and Omi gained momentum, resulting in a decrease in productivity to one tenth that of former times. With the abolition of the samurai class during the Meiji Restoration, the primary source of demand was lost which secured the decline of Nara Sarashi. However, it was the 9th generation president Masashichi Nakagawa who faced some difficult challenges. 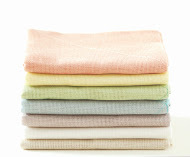 He opened up a new market by developing asetori (a sweat-absorbent underware) and swaddling clothes for newborns. In 1898, he served as the purveyor of asetori for the Imperial household. The Nara Sarashi industry continued to decline and, at one point, was close to being put out of business. However, 10th generation president Masashichi Nakagawa re-established the company as a manufacturing wholesaler after the company acquired its own Nara Sarashi factory. During this period, Nara Sarashi which made a fresh start as an urban-based handicraft industry was important industrial home work for the women and children of farming families during the agricultural off-season. Recognizing this fact, Masashichi built textile mills in Tsukigase, Tawara, and Fukusumi, and a sarashi factory in Kizugawa, endeavoring to revive Nara Sarashi which was on the verge of disappearing from the marketplace. 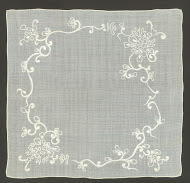 Ramie handkerchiefs were exhibited at the world exposition in Paris, France. The delicate technique of hand-embroidering bird and plant motifs onto handspun and handwoven cloth was highly appraised overseas. 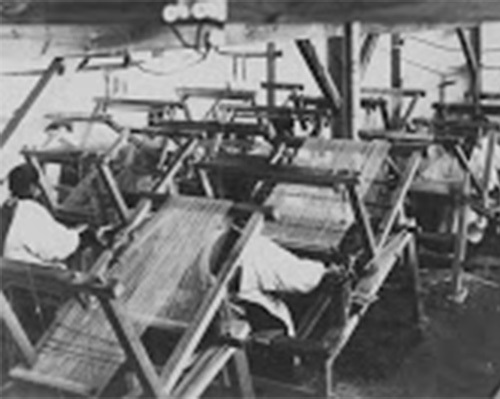 During Japan’s high economic growth period, the production of Nara Sarashi by hand became difficult owing to labor costs and the aging of workers. The industry was faced with the choice of withdrawing from the manufacturing wholesale of Nara Sarashi, or mechanizing the domestic production system. As competitors chose one of these two options, our 11th president Iwakichi Nakagawa remained steadfast in his desire to “preserve the distinct texture born from handcrafted work.” He moved production bases overseas, preserving our traditional manufacturing methods and quality. 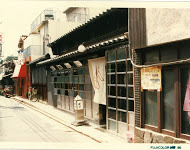 “Yu Nakagawa Main Shop” in Ganriin-cho, Nara City opens. Antenna shop “Yu Nakagawa Tokyo Ebisu Shop” in Ebisu, Tokyo opens. Our production of household goods using brightly colored hemp cloth was an opportunity to expand our customer base among younger generations. After Jun Nakagawa (who later became 13th president) joined the company, our business category shifted from manufacturing wholesale to manufacturing retail. Setting a goal to “break free from the mold of product sales, and reinvent ourselves as a brand creator,” we established our own brands and accelerated the development of our wholly-owned stores to convey to customers our passion for monozukuri (craftsmanship), which can only be appreciated by understanding the history of the production area and the skill of the craftsmen. Under the corporate philosophy “invigorate traditional Japanese crafts,” we began a consulting business specific to the craftsmanship industry. Jun Nakagawa becomes the company’s 13th president. We announce “Nakagawa Masashichi Shoten,” our household goods brand which incorporates the name of our company. Ceramic maker Maruhiro Inc. of Hasami-cho, Nagasaki Prefecture, our first client in our consulting business, achieves success with its “HASAMI” brand hit item Hasami-yaki mugcup. We celebrated the 300th anniversary of our establishment. Our Tokyo Office is established in Omotesando, Tokyo. “Nakagawa Masashichi Shoten Omotesando Shop” opens.